If you are new to baking and would like to start off with a simple fail-proof recipe for Eggless Chocolate Cake, you have come to the right place. I have tried various versions of this recipe and liked this one the best. The reasons being that there aren’t too many ingredients involved, its a simple recipe and you can use the same pan to mix the ingredients and bake it – no muss no fuss. The cake has a dense structure, almost like a Brownie. This cake is best cooled and frosted(if you plan to) in the baking pan. I partially cooled the cake and wanted to remove the cake from the pan and it broke. It was not this exact recipe but a similar eggless one. So, I would advise against it unless you are an experienced baker and know what you are doing. I am just getting started with baking and I wanted to play it safe this time. Also, this cake is not very sweet – perfect for pairing it with some Vanilla ice cream. P.S: Make sure the cake is warm. 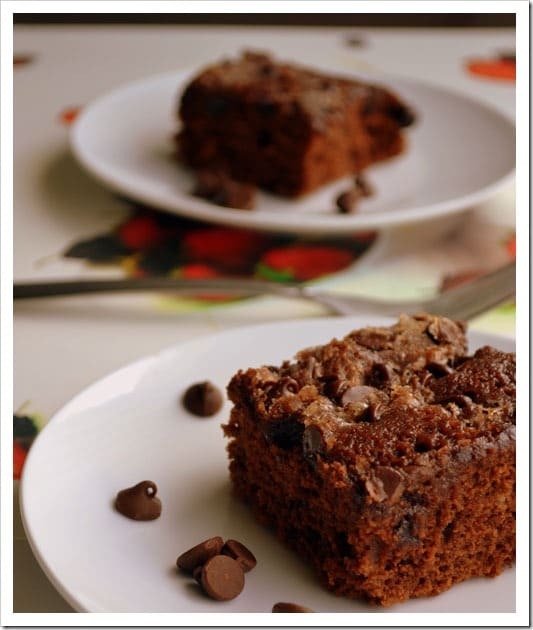 This recipe for Eggless Chocolate Cake has been adapted from Betty Crocker’s Chocolate Chip Snack Cake recipe. 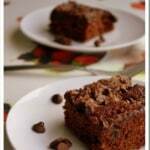 Recipe for no muss- no fuss Eggless Chocolate Cake! In an ungreased 8-inch square pan,sift flour, brown sugar, salt, soda, and cocoa. Mix them until they are blended together. Stir in the remaining wet ingredients - water ,oil, vinegar and vanilla extract. Use a spatula to blend the ingredients in and spread the batter evenly. Sprinkle the batter with chocolate chips and granulated sugar. Bake at 350 degrees F (175 degrees C) for 35 to 40 minutes, or until tooth pick inserted comes out clean.